My home country of New Zealand is a world leader in renewable energy generation, effective energy markets, and robust policies for electricity security. This is related to the unique natural resource base and geography of New Zealand, according to a new assessment report from the International Energy Agency (IEA). Renewable energy comprised 80.2% of New Zealand’s electricity generation by the end of 2015. This includes mostly hydropower, with some geothermal and wind power, and to a lesser degree solar. New Zealand is aiming to increase its renewable energy to an impressive 90% by 2025. For decades, New Zealand has taken advantage of its abundant freshwater resources to generate most of its electricity. The new report from the International Energy Agency highlights the many ways in which New Zealand is already a global energy leader, as well as the next steps the agency thinks the small, South Pacific nation should take for further success. Executive Director of the IEA, Dr. Fatih Birol, has said that, “New Zealand is a world-class success story for renewables and has excellent opportunities for using even more renewable energy in heat, but also in power supply, and for the electrification of transport.” Like much of the world, New Zealand’s transport sector is still overwhelmingly fossil-fuelled. The IEA suggests that as New Zealand’s energy sector becomes more decentralised and local, with greater shares of wind, solar, battery storage, and electric vehicles, future governments should make sure that energy consumers and market participants are encouraged to build smart systems. The already widespread deployment of smart metering and the emergence of new technologies in New Zealand provide great opportunities for more efficient, innovative and competitive electricity retail and distribution. The agency notes that future success is likely to come from small additions of hydropower generation, expansion in geothermal and wind power generation, and also significant growth in the domestic solar market. Indeed, as we’ve been reporting for years, solar power has been growing exponentially worldwide, with costs continually dropping, so there’s no reason to believe there won’t be substantial growth in solar in New Zealand, despite the already large share of renewable energy. In the transport sector, although a small market, New Zealand is currently experiencing a fast uptake of electric vehicles. The number of electric vehicles on the road more than doubled from about 1,000 at the end of 2015 to around 2,500 at the end of 2016. The IEA noted that the current government has introduced policies to increase electric vehicle uptake. Disappointingly, the IEA also suggests that New Zealand should also use its large oil and gas resource base as a way to strengthen the security of country’s electricity supply. This is surprising, given that New Zealand has been operating successfully with a large amount of renewable energy for quite some time. With more in the works from renewable sources, especially the untapped potential of solar combined with battery storage, this hardly seems necessary. 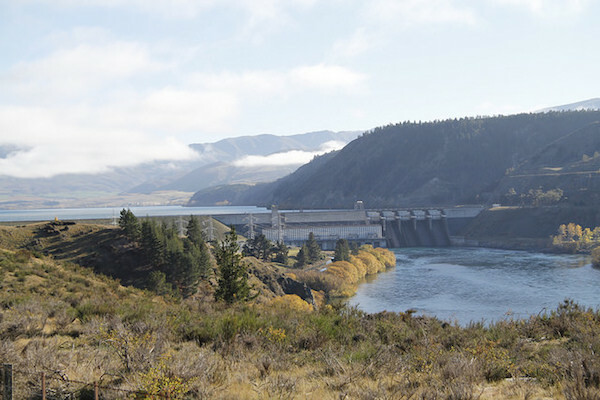 Image CC licensed by Graeme Scott : Aviemore Dam on the Waitaki River, New Zealand. Next post: Could Fossil Fuels and Conventional Cars Be Obsolete by 2030?